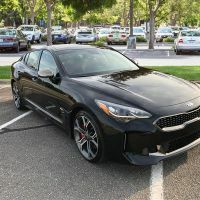 I've owned Audis for the past 15 years, never really considered looking at Kia until I saw the performance specs for the Stinger. Aside from the design and performance, the AWD option is what really sold me. Will be my second Kia. Second time for me; I wanted an Optima SX back in 2011, but they were hard to find at the time. To my eyes, that is still a good looking design after all these years. Will be my first Korean car, been owning and driving VW's for the past 15 years. I still can't believe Kia actually made this car but they sure shut me up about the brand. Same here, never imagined anything like this from Kia.